This year we witnessed the extraordinary danger of mixing buildings with earthquakes, particularly in poor regions — fortunately, a group called PAKSBAB is finding solutions. 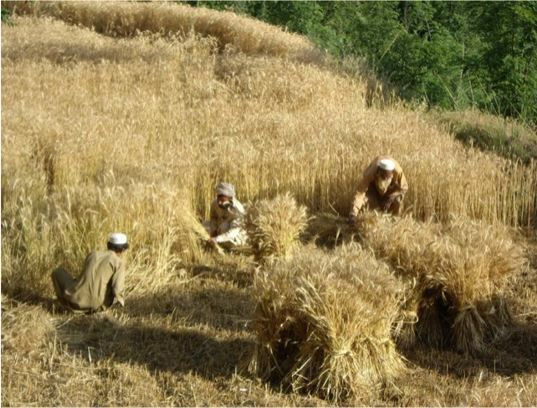 Pakistan Straw Bale and Appropriate Building is a nonprofit working at developing durable buildings that can be built with local resources, little money and stay safe during devastating earthquakes like the 2005 7.5 quake in Kashmir. The key ingredient is handmade straw bales. PAKSBAB’s founder, Darcey Donovan P.E., left for Northern Pakistan to lend a hand in rebuilding the devastated region. She brought with her a lot of experience with straw bale building. She found that there were no baling machines where housing was needed so she developed a simple jack and form system to produce the needed straw bales. The prestressed bails are set on a stone foundation and support a truss roof. Bamboo and netting help secure the walls. The bails act as both the supporting wall and insulation. A couple coats of clay plaster protect and help preserve the straw. The 25 ft by 25 ft buildings cost a mere $2250 for materials — what many of us are willing to pay for countertops. Currently they have finished 11 buildings that are energy-efficient, safe, and very low impact. How do they fare in earthquakes? 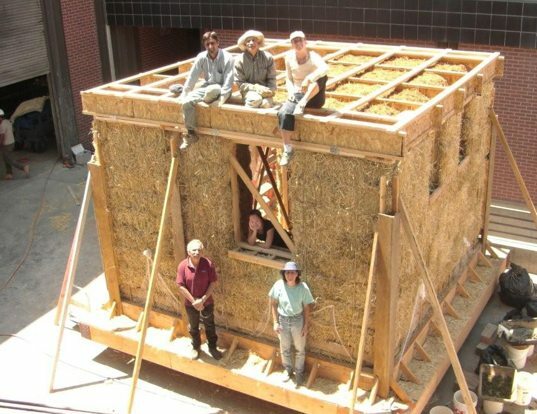 To find out Ms. Donovan built an 11 ft by 11 ft straw bale structure on a seismic simulation table and let ‘er shake. This video shows it in action. Although severely damaged, the building did not appear in danger of collapse, even at the end of the test sequence. This means lives saved and resources wisely used by applying appropriate building technologies for those who can most benefit. Add another item to the list of the positive values of straw bale building. Have you looked at alternatives to metal roofing, such as thatch? Are you collecting rainwater for household use? This year we witnessed the extraordinary danger of mixing buildings with earthquakes, particularly in poor regions -- fortunately, a group called PAKSBAB is finding solutions. Pakistan Straw Bale and Appropriate Building is a nonprofit working at developing durable buildings that can be built with local resources, little money and stay safe during devastating earthquakes like the 2005 7.5 quake in Kashmir. The key ingredient is handmade straw bales.